Barça B remain on an upwards curve. Last weekend, Gerard López's team beat Llagostera at a ground that nobody else had managed to do so far, this Wednesday, the Catalans beat the team in second, València Mestalla (3-1). The victory was hard-fought and came following a comeback after Aridai put València ahead. However, three Dani Romera goals created for him by three excellent assists by Jesús Alfaro, gave Barça B the win that consolidates their first position in Group 3 of the Division 2B with 25 points. The game between the second teams of two great clubs lived up to expectations with an open and fiercely contested opening half. They went into the interval on level terms with a goal apiece but there were chances aplenty for both sides in a thrilling encounter. 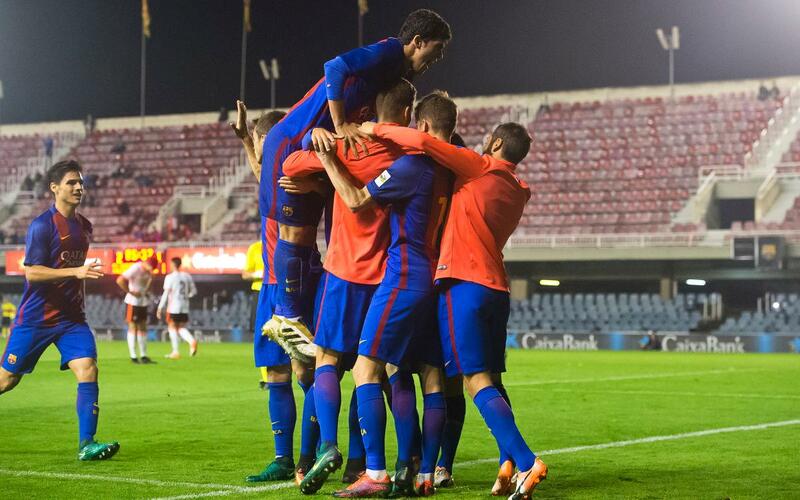 Prior to Aridai's opening goal for the opposition in the 28th minute, Barça B had had various chances to open the scoring. Marc Cardona almost found the back of the net from a tight angle but ended up sending his effort just over the crossbar. Aridai, who is València's top scorer, was dangerous throughout and also threatened with two shots in quick succession, which Moisés did well to save. López's team gathered their composure and managed to get a goal back. Carles Aleñá played the ball into the box to Alfaro who went down under pressure and Romera was quickest to the rebound giving Barça the equaliser they were looking for before half-time in the 40th minute. The goal gave Barça added impetus and it didn't take them long to turn the result on its head thanks to a fantastic diagonal ball from Alfaro to Romera who finished excellently and gave the team from Barcelona a 2-1 lead in the 51st minute. València found themselves behind for the first time in the game and pushed for an equaliser pressing high up the pitch and leaving more spaces in behind. Aridai had some good efforts but the clearest chances fell to the blaugranas with Aleñá twice and Cardona both going close. Romera completed his hat trick with ease in the 75th minute following some excellent play yet again from Alfaro. This time an exceptional cross left Romera with a simple tap-in that finished off the game and gave the home team all three points. València continued to play and looked for a way back into the game but the 3-1 scoreline proved insurmountable for them. Gerard López's men claimed a crucial three points giving the Catalans some extra breathing space at the top of the table having beaten the team in second.